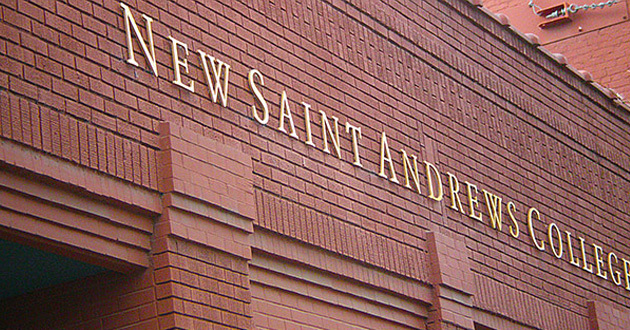 New Saint Andrews College is committed to the lordship of Jesus Christ over all things. We provide a rigorous liberal arts education in the classical Christian tradition in the context of real Christian community. Our purpose is to graduate leaders in all walks of life who are eager to shape culture through wise and victorious Christian living. We are thoroughly Trinitarian, solidly Protestant and Reformed, and robustly evangelical. The liberal arts are tools to teach critical thinking – the rigorous process of making distinctions, recognizing logical fallacies, and careful argumentation. They demand integration, the ability to move from part to whole and back again to part; to move back and forth between both breadth and depth. They require skillfulness with words, arguments, and stories – not merely the ability to communicate clearly, but the ability to be persuasive, humorous, offensive, and innocuous – to teach and delight with the word and to be taught and delighted by the same. The liberal arts combine the best of the contemplative life with the life of the active creator, emphasizing doing and making as much as thinking and receiving, as they cultivate truth, goodness, and beauty. As funds permit, the College offers need-based and merit-based scholarships. To protect the religious integrity and freedom of our Christian institution, the College does not participate, on principle, with any government-sponsored financial aid programs. Instead, a private scholarship organization is available to provide assistance to needy and deserving students. Please see the website for Scholarship information.